Mousehold Heath is an area of woodland and heath land measuring approximately 200 acres which lies in north-east Norwich. 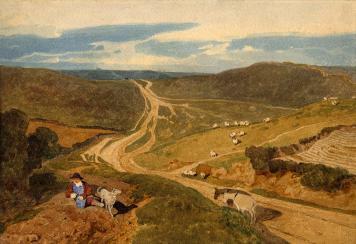 Originally, the heath was much larger and stretched as far as South Walsham. Today it is an important recreational area for the people of Norwich containing footpaths, football pitches and Zak's restaurant. In 1144 the body of a boy named William of Norwich was found on the heath and his death was attributed to ritual murder carried out by Jews. Eight hundred years later, this 'blood libel' became the subject of a play by Arnold Wesker which was first performed at the Norwich Playhouse in 1996. Wesker first moved to Norwich in the 1950s when he came to work as a kitchen porter at the Bell Hotel on Timberhill. Today, there are a number of stones on the northern side of the heath (close to Mousehold Lane) which mark the location of St. William's Chapel which was originally consecrated in 1168. The chapel was supposedly built on the site where the boy's body was discovered. At one time there was a rood screen depicting St. William inside the St. John Maddermarket Church in Norwich - but this was moved to Holy Trinity at Loddon. "When a man dies, he is cast into the earth, and his wife and child sorrow over him. If he has neither wife nor child, then his father and mother, I suppose; and if he is quite alone in the world, why, then, he is cast into the earth, and there is an end of the matter." "There's night and day, brother, both sweet things; sun, moon, and stars, all sweet things; there's likewise a wind on the heath. Life is very sweet, brother; who would wish to die?" The heath also has an association with the novelist R.H. Mottram and is the location for his memorial which was made by the Norwich-based sculptor David Holgate. The work stands at the top of St. James' Hill and commands a spectacular view of the City. Mottram, who was also a Lord Mayor of Norwich, is probably best known for his Spanish Farm Trilogy - which was based on his experiences in World War 1. Mottram was also a keen conservator of Mousehold Heath and once touchingly declared it: 'the property of those who have the privilege of Norwich birth'.